MORGANTOWN, W.Va. – No. 12 West Virginia’s passing attack was too much for Kansas State, as quarterback Will Grier threw for five touchdowns, including three to wide receiver David Sills, to guide the Mountaineers to a 35-6 victory in front of 59,245 fans at Milan Puskar Stadium on Saturday. Led by Grier, the West Virginia (3-0, 1-0 Big 12) offense registered 464 yards of total offense, including 356 yards through the air. Grier’s five touchdowns were the most by a K-State opponent since Oklahoma State’s Mason Rudolph threw for five touchdowns on November 5, 2016. Defensively, the Mountaineers held the Wildcats (2-2, 0-1 Big 12) to 318 yards of total offense, including just 3-of-14 efficiency on third down. All six points came off the foot of sophomore place kicker Blake Lynch, who made 25-yard and 38-yard field goals in the second half. Several K-State players reached milestones on Saturday, including junior wide receiver Isaiah Zuber reaching 1,000 career receiving yards, becoming the 31st individual to reach the mark. Zuber, who finished with a career-high 10 catches for 133 yards, has now reached 100-yards receiving in consecutive games for the first time in his career. Defensively, sophomore defensive back A.J. Parker and junior defensive back Johnathan Durham collected their first-career interceptions. After forcing just two turnovers in their first three games this season, the Wildcat defense made a statement early against the Mountaineers on Saturday, forcing turnovers on the first two West Virginia possessions. On the opening possession, Grier fired a pass down the field, which was heavily defended and intercepted by Parker. The interception marked the first of Parker’s career and the second interception for K-State this season. On West Virginia’s second offensive possession, the Wildcats shut down the Mountaineer attack by recovering a fumble on the hand-off exchange between Grier and freshman running back Leddie Brown. Junior defensive tackle Jordan Mittie capitalized on the fumble, pouncing on it at the K-State 28 for his first career fumble recovery. WVU responded on its following offensive possession, as Grier found junior wide receiver Marcus Simms open for an 82-yard receiving touchdown to find the first points of the game with 4:46 remaining in the first quarter. In the second quarter, Mittie and the K-State defense prevented the Mountaineers from putting more points on the board. On third and four from the K-State 30-yard line, Mittie recorded his first sack of the season, wrapping up Grier for a loss of four. On fourth down, WVU called upon its field goal unit, which came up unsuccessful on a 51-yard field goal. Later in the second quarter, West Virginia went back to the air to expand on their lead, this time from Grier to Sills. Grier and Sills capitalized on two touchdowns in the final three minutes of the first half, both of which came from one-yard out, as the Mountaineers went into halftime with a 21-0 lead. The Wildcats found their first offensive spark in the third quarter, when sophomore quarterback Skylar Thompson found Zuber open for a 40-yard catch and run. The big play led to a 25-yard field goal conversion by Lynch. The Mountaineers continued to capitalize through the air in the third quarter, connecting on two more touchdowns from Grier, including a 62-yard touchdown pass to sophomore wide receiver Tevin Bush, to lead 35-3. In the fourth quarter, Lynch improved to 9-of-11 on field goals this season and his second of the game, converting on a 38-yard field goal to bring the score to 35-6 with 13:48 remaining in the game. The Wildcats were led on offense by Zuber’s 10-catch, 133-yard effort, as sophomore Skylar Thompson finished with 145 yards on 11-of-17 attempts and junior Alex Delton threw for 82 yards on 7-of-12 attempts. Defensively, junior linebacker Da’Quan Patton led the team with nine tackles. Isaiah Zuber – Leading the Wildcats in receiving in two of three games this season, Zuber paced the Wildcats again in receiving on Saturday, hauling in 10 receptions for 133 yards. Zuber also surpassed the 1,000-yard career receiving plateau on Saturday, becoming the 31st player in school history to hit the mark. 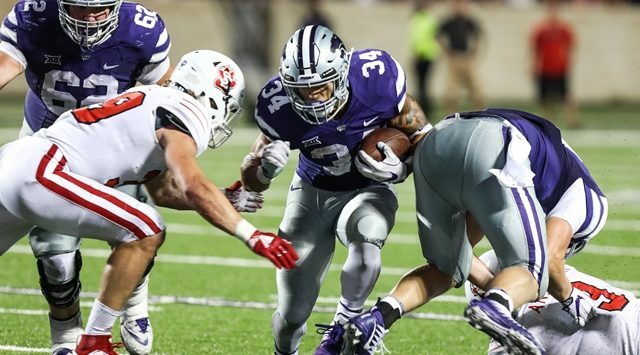 Jordan Mittie – The junior defensive tackle marked two career-firsts as a Wildcat on Saturday, recording his first fumble recovery and sack in a K-State uniform. In the first quarter, Mittie scooped up a botched West Virginia handoff for K-State’s second fumble recovery of the season, before wrapping up quarterback Will Grier for a four-yard sack later in the quarter. The sack marked Mittie’s fifth of his career, with his last sack in a Texas State uniform on October 12, 2017. Johnathan Durham – A native of Aledo, Texas recorded his first-career interception on Saturday, picking off Grier in the third quarter. Andrew Hicks – The redshirt freshman punter was busy on Saturday, punting four times with an average distance of 49 yards, including a long of 62 yards. Hicks pinned the West Virginia offense inside the 20-yard line on his first punt of the day, which was downed at the West Virginia 4-yard line. Blake Lynch – Lynch connected on field goals of 25 yards and 38 yards on Saturday, improving to 9-of-11 on field goal conversions this season. Lynch’s sole miss on Saturday came from 50-yards out in the fourth quarter. 31 – Isaiah Zuber became the 31st Wildcat to reach the 1,000 career receiving yard plateau on Saturday, hauling in 10 receptions for 133 yards.